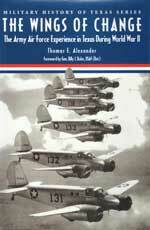 Expertly written by Thomas E. Alexander (a former Air Force Captain and Major in the Illinois Air Guard), The Wings Of Change: The Army Air Force Experience In Texas During World War II is a superbly presented military history of how sixty-five Army airfields came to be located in Texas during the years of World War II. From an economic influx that helped spur the state's lift out of the Depression, to the local residents adaptation to living with Army Air Force soldiers, The Wings Of Change blends history, black-and-white photography, and historical insights to accurately portray the manifold changes that the Army Air Force brought to Texas. The Wings Of Change is a welcome and original contribution to Aviation History and Military History reference collections.